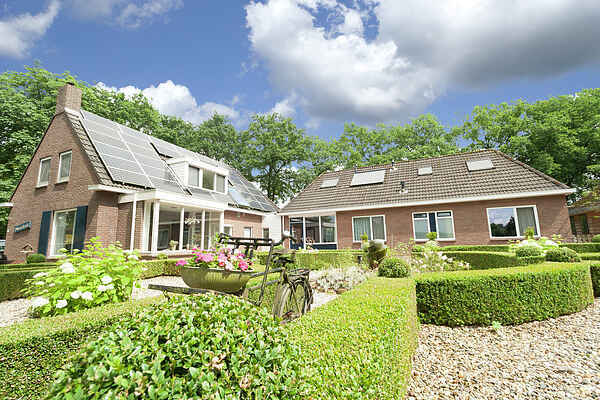 This comfortably furnished house for groups lies in the round village of Exloo, in the east of the province of Drenthe. The house has en suite bedrooms, a living room with an eating and sitting area and a professional kitchen with combi steamer, microwave, fast dishwasher and extra fridge. The terrace offers a lovely view of the farmland with vast heath land and forests in the distance. The holiday home's location is perfect for biking and hiking. Approximately 900 m away lies the centre of Exloo with several restaurants and shops and Kabouterland with an indoor and outdoor playground. The city of Emmen with the Northern Zoo is 12km away. You should also visit the Borger Hunebed centre and museum village Orvelte. Plopsaland in Dalen is highly recommended just like the Drouwenerzand in Drouwen; an all-in amusement park! Extra information: - The home-owner lives in the house next door. - This group accommodation is suitable for maximum 21 people. Groups of over 18 people can rent an extra en suite three-person bedroom (35 a night).